Elder abuse in Latino communities is a common phenomenon that often goes unreported. A 2012 study conducted by the University of Southern California (USC) found that 40 percent of the 198 Latino immigrant older adults interviewed had experienced abuse, and 21 percent had suffered several forms of abuse. Of the older adults that were abused, only 1.5 percent reported the abuse to Adult Protective Services. 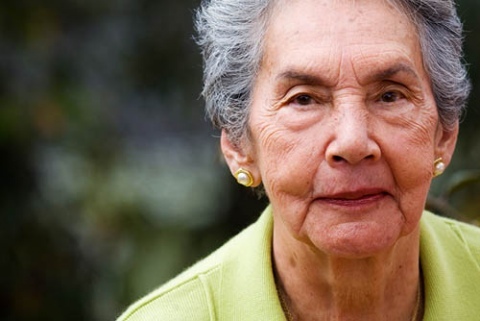 As the population of Latino older adults in the U.S. is projected to grow almost six times larger in the next 45 years, it is crucial that trained elder abuse advocates and providers consider both the protective and risk factors for elder abuse in Latino communities, as well as how professionals can best serve Latino older adults who are at risk of being abused. With our increasing population and diversity, talking about specific communities’ needs and how elder justice professionals can effectively implement cultural competency in their work with Latino older adults is not just useful, it’s necessary. Cultural values can serve as important protective factors for older adults, but sometimes those values contribute to the underreporting of elder abuse in the Latino population. Dr. Gassoumis refers to this as “a double-edged sword…. Important protective factors such as strong familial networks, respect for elders, and the norm of intergenerational living establish respect and comfort with the aging experience. Knowing that the person living in your home is your abuela [grandmother] and that you have to treat her with respect, elevates the elder in the family.” However, he adds, “Intergenerational living sometimes means living with people who may not have the best intentions and may be perpetrators of abuse.” In the Journal of Elder Abuse and Neglect, Victor Montoya, MA, MSW (1997), an Adult Protective Services supervisor in Colorado, explains that “loyalty and sacrifice, interdependence, and privacy are values and rules that have protected, empowered, and sustained Hispanics through times [both] good and bad.” These values are certainly positive and often support and strengthen familial bonds. However, Montoya adds that sometimes this level of affiliation and loyalty can inhibit an abuse victim of any age from revealing mistreatment or allowing a family member to be confronted. Machismo: According to the NCEA, machismo is defined as “pride in being male; virility, masculinity.” A study published at Michigan State University in 2007 explains that, “negative machismo” constitutes “male dominance, sexual prowess, and the submission of women.” If women believe they must be submissive to their husbands, they might be less likely to report domestic violence in older age. Male victims may also hesitate to report abuse, due to their need to be seen as powerful and in control. In the 2012 study by USC, which Dr. Gassoumis co-authored, cultural competency played a large role in how research was conducted. “Monolingual Spanish-speaking promotores were employed to conduct door-to-door interviews. Traditionally, the role of promotores, Latino community health workers, is to provide culturally sensitive linkages between communities and health and social services….Promotores were recruited through a partnership with a local agency that serves the target area. The agency had well over a decade of experience hiring, training, and employing promotores for a number of health-related programs in the Latino community.” After finding a high prevalence of elder abuse in Latino communities, the researchers hypothesized that “respondents may have felt more comfortable discussing mistreatment with promotores who represent their culture and community.” The work and presence of the promotores was vital to identifying the prevalence of elder abuse in their communities. This experience showed that it is essential for organizations to recruit community members on staff who share the same language and culture as their clients. One organization that serves primarily Latino communities and provides a bilingual and culturally appropriate experience is Bronx-based Neighborhood SHOPP. Casa Boricua, one of Neighborhood SHOPP’s senior centers, offers Latino adults a social network that speaks their language and understands their culture. Neighborhood SHOPP also has a Violence Intervention & Prevention (VIP) program that “focuses on alleviating the effects of domestic violence and crime on older Bronx residents and helping to prevent victimization of the elderly.” The VIP Program is staffed by bilingual, bicultural professionals from Puerto Rican, Dominican, African-American and Caribbean/West-Indian backgrounds, reflecting the culture of clients served. Neighborhood SHOPP’s Executive Director, Dr. Evelyn Laureano, discusses Neighborhood SHOPP in this NYCEAC blog. 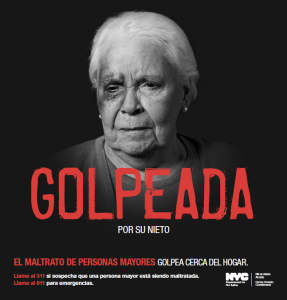 Elder abuse awareness campaigns that target Latino communities are also an important step in preventing abuse, and in New York City, two organizations are leading the way. 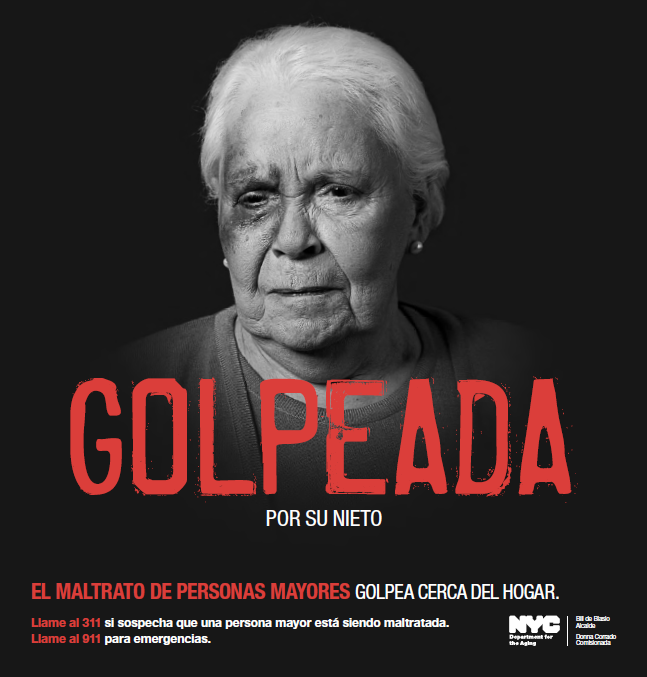 The NYC Department for the Aging (DFTA) ran an ad campaign in April and May 2016, which included posters in Spanish in order to increase awareness in Latino communities. We reported on it in this blog post, where you can learn more about the campaign. Because la familia is extremely important to Latino older adults, Dr. Gassoumis emphasizes that abuse prevention strategies should focus on “supporting the family, as opposed to accusing the family.” Kathleen Wilber, PhD, of USC’s Leonard Davis School of Gerontology and Laura Mosqueda, MD, of USC’s Keck School of Medicine, are leading a new planning project to develop an elder abuse prevention intervention program called the Strengths-based Training on Prevention of Elder Mistreatment (STOP EM). While the project will not be targeting any specific racial or ethnic groups, Dr. Gassoumis, who is also involved in the project, explained “the STOP EM team will be engaging elders who are approaching care transitions, being discharged from the hospital, or are in stressful situations to support them and their families in preventing abuse.” By supporting families of older adults, USC researchers will seek to measure the effectiveness of family-based interventions in preventing the risk of elder mistreatment. Improve cultural competence of professionals and organizations.Increase seminars, lectures, and/or classes that teach professionals about cultural protective and risk factors for elder abuse. Organizations should also seek to recruit community members on staff who share the same language and culture as their clients. In promoting employee diversity in social service agencies, agencies can more effectively connect with and serve Latino older adults. Partner with promotores. Spanish-speaking community health workers possess a cultural knowledge and sensitivity that strengthens the client-worker relationship. By conducting door-to-door outreach in Latino communities, promotores can cultivate trust and connect isolated older adults with the information and resources they need to stay safe and seek help when needed. Increase intergenerational, cross-cultural relationships. Professionals and advocates should encourage friendships across the lifespan, which will strengthen older adults’ social networks, decrease isolation, and reduce the risk of abuse. Develop strategic public awareness campaigns. Other organizations might consider taking DFTA’s lead and develop public awareness campaigns for the Latino community. Also, to this end, the elder justice movement could use social media strategically. Elder justice professionals have already begun using social media to spread the word about elder abuse (read about the work of the Elder Justice League here). Let’s continue these efforts with a focus on the Latino population. What are your ideas for preventing elder abuse in Latino communities? Please comment below to share your thoughts. Melanie Turner, NYCEAC 2016 Risk and Resiliency Internship Project Intern, is an undergraduate student at the University of Virginia. Kasey Brown, Program Assistant for NYCEAC, is a graduate social work student at Fordham University.